WSU is committed to providing its students, staff, and faculty healthy meal options to ensure a quality on-campus dining experience. A balanced diet and proper nutrition provides for a stronger, happier learning experience and WSU’s Dining Services is dedicated to create this atmosphere for its patrons. Having options that are local not only supports local businesses and farms, but also reduces our carbon footprint. By providing more options for students with dietary or cultural restrictions, Dining Services is leading the way to giving the WSU campus the widest variety and healthiest meal selections for people of all walks of life. Dining Services works to provide guests with an excellent dining experience and the most nutritious food. The department is committed to proper labeling and providing a wide variety of healthy options. Labels with certain icons can help customers discover if the product they want is organic, locally sourced, vegan, vegetarian, gluten friendly, or allergen friendly. Dining Services is also proud to have gained MSC and SPE certifications-accreditations that guarantee the food is from sustainable suppliers and is also nutrient-rich. Throughout the United States, health has been a growing issue and a primary cause is from food and the unhealthy options provided to the public. Many people choose the quicker, cheaper route to purchasing food, such as chips, crackers, frozen meals, or take-out meals from restaurants. This way of living, albeit fast and easy, is not healthy. Better food and eating habits will improve the overall health of people and the planet. By reducing the amount of pre-packaged food bought, there is less of a demand and, thus, less waste in the form of wasteful excess packaging and unhealthy farming practices. Sustainable farming industries will be key to sustaining a planet with finite natural resources which have been presumed to be infinite for too long. 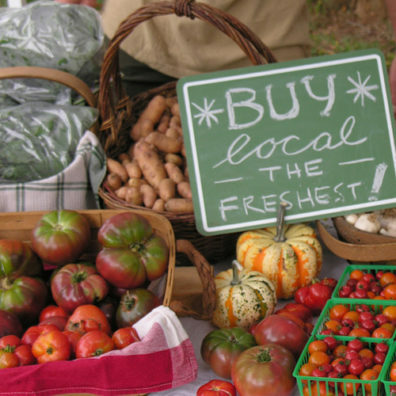 How you can Help- Purchase Locally Grown Food! Purchasing locally grown food is an easy, effortless chance anyone can mate to their daily routine. Local should refer to food that was harvested within 100 miles of where it’s purchased (or 50 miles if in an agriculturally productive area). Surprisingly, making this change can make a big impact on our environment. Purchase more fresh food; like produce, meats, poultry, and fish (locally of course). Reduce the amount of processed or packaged foods. If possible, grow your own vegetables in a garden and have your own animal products; like growing tomato plants and having chickens to lay eggs.